Prototype: Two (2) cars from the track construction train for the DBG / DB Railroad Construction Group. One (1) each type Res 4-a stake car loaded with track ballast and one (1) each type Fcs rotary slide valve dump car. 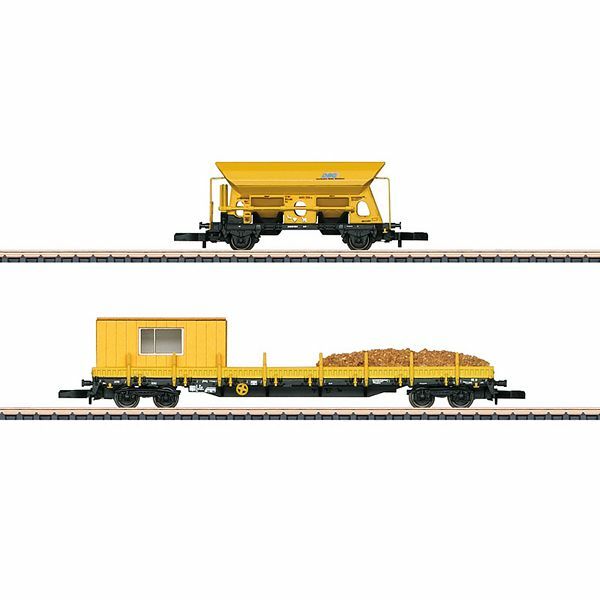 Model: This is a DBG add-on set for things such as 81071 or 81451, consisting of one (1) each type Res stake car with a load of track ballast and one (1) each type Fcs rotary slide valve dump car. In addition, two (2) building kits for a railroad hut for loading on the stake car are included. Both cars have their own car numbers. Total length over the buffers approximately 137 mm / 5-3/8". Two (2) building kits for a railroad hut included.